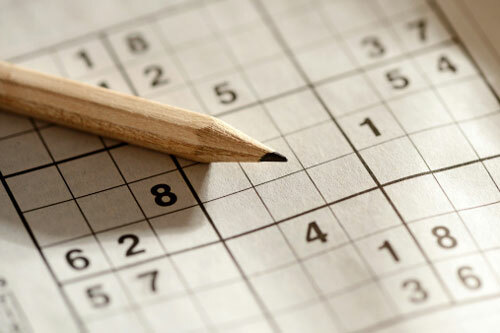 According to a case report recently published online in JAMA Neurology, researchers describe a rare incident where a man had developed seizures brought on by completing Sudoku puzzles. The patient was a 25-year-old right-handed physical education student who was recently involved in an avalanche accident. The skier was buried under the snow and was hypoxic (oxygen deficient) for 15 minutes until he was rescued by a friend who performed cardiopulmonary resuscitation (CPR). He sustained a ruptured spleen and fractured ribs. He also developed involuntary myoclonic jerking of the legs and mouth. This made it hard for him to walk and talk. Later on, as the man was working on Sudoku puzzles, he experienced clonic seizures of the left arm—this is a type of generalized seizure that affects the entire brain. Sudoku puzzles require you to fill in a grid so that every row, column, and box (three squares by three within the grid) contains the numbers one through nine without repeating in any one row, column, or box. A Functional MRI showed this mental imagination while completing the puzzle led to overactivation of the right central parietal cortex. Imaging showed a loss of right centroparietal inhibitory neurons called U fibers. This injury resulted in three-fold increased evoked potentials at the right postcentral gyrus after somatosensory stimulation of the left median nerve. The deficiency in oxygen reaching the tissues may have caused some damage and a regional loss of right centroparietal U fibers, resulting in impaired inhibition. Study authors explained that functional activation of the hyperexcitable region caused focal epileptic seizures. The case is rare, the only one worldwide, according to Dr. Feddersen. To date, the patient no longer does Sudoku puzzles and has been seizure-free for over five years. Physiotherapy has been a huge help, although he still has difficulty talking and walking. Anderson, P., “Sudoku and Seizures?” Medscape web site, October 22, 2015; http://www.medscape.com/viewarticle/853085?nlid=89449_3681&src=wnl_edit_dail&uac=247315HK&impID=865708&faf=1.